Lapped by the Atlantic Ocean to the west, and Indian ocean to the east, South Africa’s beautifully rugged landscapes are often at the top of travel bucket lists. Aussie’s fly for over 14 hours to Cape Town’s hub with the hope of tracking down the Big Five on safari. Upon arrival, they are not only greeted by the prowess and grandeur of animals in their natural habitat but also find themselves swept up in South Africa’s vast cultural offerings. South Africa has something for every traveller; scenic hikes, golden beaches, vast plains, delicious cuisine and award-winning wine tastings. Despite this, the combination of history and media has left many slightly cautious of making the journey across. The country’s rapidly rising popularity is a sign that the times are changing, now far safer and more accessible for travellers. If you’re planning a trip to South African shores, we’ve put together a guide to not only quell any fears, but also ensure you’re getting the most out of your time and rand. South African Rand (ZAR). Each rand is made up of 100 cents. As a rule of thumb, 10 Rand is about 1AUD. The most you can take in or out of the country as cash is 25,000 rand. There are 11 official languages in South Africa - Afrikaans, English, isiNdebele, isiXhosa, isiZulu, Sepedi, Sesotho, Setswana, Siswati, Tshivenda and Xitsonga. South Africa is a big country brimming with sightseeing opportunities. We have provided recommendations based on our own personal experience, whilst also taking into consideration the relative safety of individual locations. Perhaps the most popular tourist city in South Africa, Cape Town is a culturally diverse and modern city. Cape Town is not only a destination in itself but also serves as a base for travel further afar. Soak up the views from Table Mountain, enjoy a casual stroll across the waterfront and indulge in some delicious cuisine. 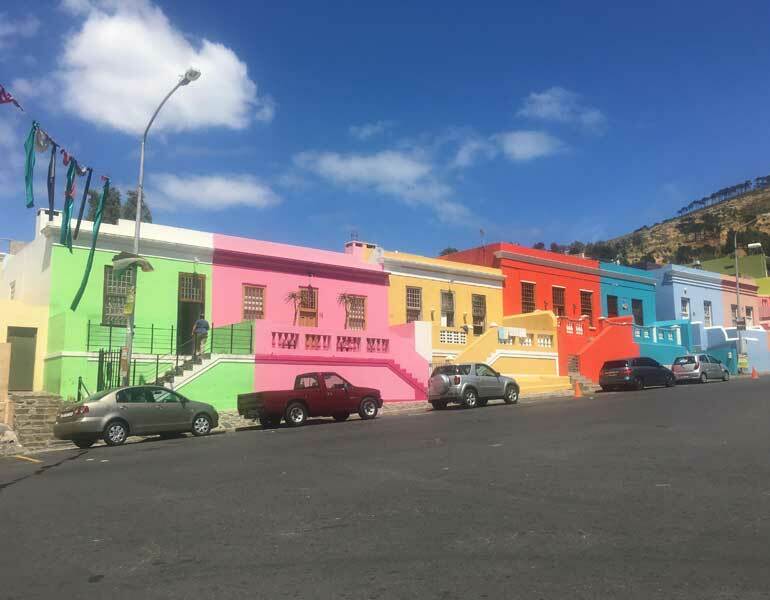 Colourful houses in Bo-Kaap, a neighbourhood in Cape Town. Krugar is one of the largest game reserves in South Africa and boasts all of the Big 5: lions, leopards, rhinos, elephants and buffalos. You simply cannot visit South Africa without treating yourself to a safari. Nothing really compares to observing these glorious animals interacting in their natural habitat. If you love indulging in delicious food and even better wine, a tour through the vineyards of Franschhoek and Stellenbosch is the way to go. Located about 40 minutes apart, you could ideally spend a few nights in both locations to truly make the most of everything the beautiful scenery has to offer. 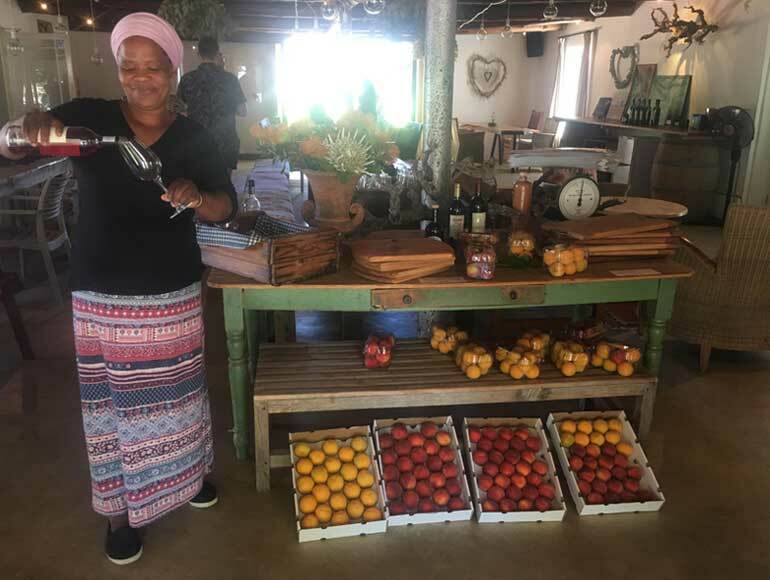 Wine tour and fresh fruit in Franschhoek. If you’re travelling to South Africa between June and November, be sure to swing by Hermanus for some whale watching. If taking a boat tour, make sure you read reviews and ensure the company adheres to animal welfare restrictions. Alternatively, there is a 10km cliffside walk scattered with telescopes and benches that offer the perfect viewing opportunity. Braai’s started in Johannesburg when butchers set up BBQ’s in front of their shops on weekends to help sell their meats. The allure of the Braai stems from more than just the delicious meat on offer, but also the ability to meet some locals and soak up a pretty remarkable atmosphere. Similar to beef jerky, biltong is thinly sliced, spiced and air-dried meat. It is cured in a range of oils and spices before being hung to dry out. Not only is it a great, low-fat snack, but it’s also the perfect opportunity to try local delicacies like springbok, ostrich and wild boar. Simple, carb loaded and delicious, bunny chow is literally a hollowed out loaf of bread filled with curry. Yes, please. Durban. It’s painted as a great beach town, but in reality, is a pretty unsafe and super rundown version of the Gold Coast. Johannesburg: Don’t dedicate any more than one night to Jo-berg. It’s dirty and pretty unsafe, though generally a necessity as you will fly in here. Leaving valuable items in your car: Out of sight, out of mind. Lock your valuables in the boot to avoid temptation for potential break-ins. Flashing your jewellery and gadgets around: As above, don’t make yourself a target. Dodgy tours: Do your research to ensure your tours are safe and reputable, especially when it comes to animal welfare. 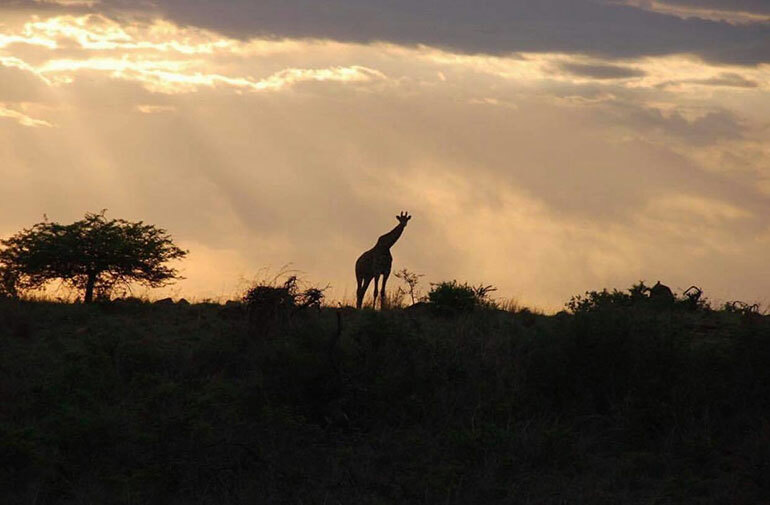 Sunset views with a giraffe on safari. Table Mountain: Either hike or catch the cable car to the top to enjoy unspoiled views of the Cape Peninsula and city. Save water: South Africa is in the midst of extensive drought. Every drop counts. Book tours in advance: Save some money and ensure you don’t miss out by booking tours and excursions in advance online. Hire a car: Whilst there are taxis, ubers and public transport available, they can be slightly dodgy. Instead, hire a car and drive at your own pace. Perfect for exploring the countryside and visiting locations within a few hours of Cape Town. 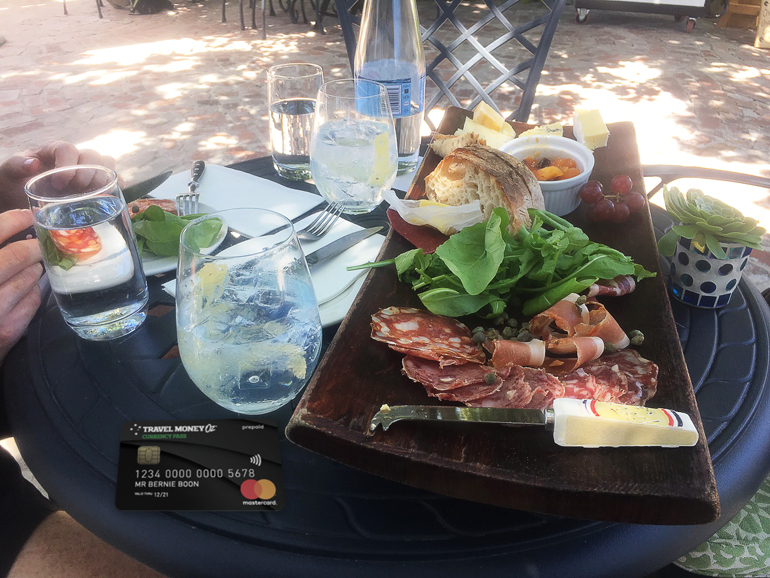 Pay card minders: Often, after you park, you will be approached by someone offering to mind your car whilst you’re off living your best holiday life (eating, shopping, sightseeing etc). This is a legit thing. So, provided they are wearing an official government bib, they will stand guard over your car to deter break-ins. You can pay them a few rands (coins are enough) for this service. Despite having card facilities available, South Africa is still a cash dependent society. We recommend exchanging AUD to ZAR before your leave Australia at Travel Money Oz. Follow the 60/40 rule - 60% of your travel funds as cash and 40% loaded on your Travel Money Oz Currency Pass. That way, you’re not carrying heaps of cash on you, and can withdraw funds when necessary in bigger towns. Just be mindful of niggly ATM fees. Flights aside, South Africa is a very affordable location. Depending on your travel style, accommodation can be a similar price to Australia, however food and drink is super cheap. When planning your budget, be sure to account for tipping. About 10% for services should suffice. Wine - $6 AUD for a delicious local bottle. 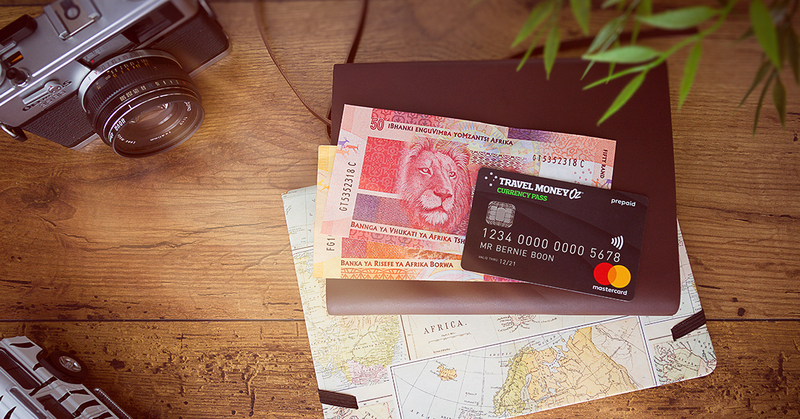 If you are after more South African travel money advice or are simply ready to purchase your ZAR, be sure to head into your local Travel Money Oz and speak to the experts. All rates are quoted from the Travel Money Oz website, and are valid as of 21 March 2019. Prices are estimations only and may differ based on your location, purchase and other individual factors.